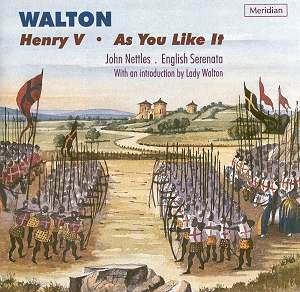 This Meridian disc opens with an introduction by Lady Walton herself, speaking on her late husband and Henry V – a track that many may find fascinating, and a few, irritating. The majority of the playing time is taken up with the music to Laurence Olivier’s film of Henry V. This is wonderful material, containing some superb pastiche sections - towards the beginning and end of the “Musical Scenario” - as well as some tunes that will be familiar from such sources as folksong, the Fitzwilliam Virginal Book, and even Canteloube’s Songs of the Auvergne. Here, we have a chamber version of the film score arranged by Edward Watson for only eleven players. It was commissioned by the English Serenata, who play on this disc, to enable them to give concert performances of Henry V along with Façade. The arrangement is meant to “reflect the theatrical roots from which the music sprang”. That is all very admirable, but one must bear in mind that although the play was written for a theatre, the music was actually written for a film, not a theatre. The small orchestral arrangement is a pale imitation of the full score. It is effective at times, but does not do justice to scenes such as Agincourt at all – it is simply not half as impressive in this scoring, despite the fact that the English Serenata do give it their all. John Nettles narrates the spoken sections and is absolutely superb - evocative, moving, powerful, and with excellent accents. Walton’s first collaboration with Olivier was on the film of As You Like It. The version on this disc is also an Edward Watson arrangement and comprises four orchestral movements, including a song that was not included in the film itself - Under the Greenwood Tree, well performed by a mellifluous Lorna Rushton. The work opens with the famous speech “All the world’s a stage” and has one other spoken part. This worked better in its reduced version, and is given a wonderfully lively performance by the English Serenata and conductor Guy Woolfenden. I would certainly go and see the English Serenata give a concert performance of these works, but if I was buying a disc of the film music for Henry V there’s no doubt that I’d go for one of the full orchestral options. Nevertheless, it is an intriguing concept, and the English Serenata bring it off as well as could possibly be expected. "All the world's a stage..", The Forest of Arden, "Why should this a desert be?... ", Under the Greenwood Tree, The Fountain segue Tempo di Menuetto, Wedding Procession.